In Cushioned Pneumatic Linear K-series Vibrators linear vibration is generated by the movement of an internal floating piston rather than the impact between surfaces, which is why these vibrators are also called Cushioned Piston Vibrators. They are particularly efficient with bulk materials that tend to stick to the wall, with hygroscopic materials, those having coarse particle size electrostatics powders such as or powders which tend to granulate. Cushioned Piston Vibrators are an effective solution against bridging rat-holing phenomena in indoor applications where low noise of maximum 80 dB(A) clean design are normally requested. In compliance with ATEX EX II 2DG cT(x), Cushioned Piston Vibrators are suitable in explosive environments. The K-Series is available in four sizes. All models are manufactured from anodized aluminium. Installation or retrofitting is particularly easy. 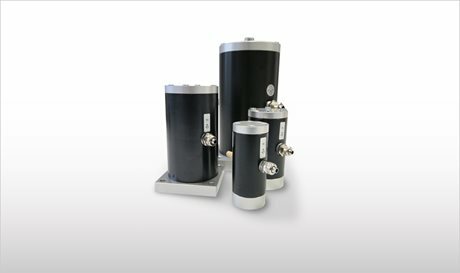 K-Series vibrators operate at pressure ranging from 2 to 6 bar (29 ~ 87 PSI).